The hotel exec shares insight into Marriott's growth plans and new initiatives. Marriott International is currently in the midst of a huge global expansion, having recently announced plans to open more than 1700 new hotels around the world by 2021. In Australia, New Zealand and the Pacific, the company is well on its way to achieving its goal of 50 hotels by 2020. Here, Sean Hunt, area vice president, Australia, NZ and the Pacific at Marriott International, shares insight into Marriott’s plans for 2019 and beyond. What is Marriott International’s outlook for 2019 and beyond? Our outlook for the next few years is extremely positive. We currently have 31 hotels in operation across Australia, New Zealand and the Pacific, with a further 21 hotels in the pipeline – taking us one step closer to our goal of 50 hotels by 2020. How will Marriott International focus on business events in 2019? We want to continue providing planners and guests with access to new and inspiring meetings and event spaces. Take Sydney for example, we’ve just completed a multi-million-dollar renovation of Sheraton Grand Sydney Hyde Park, putting this iconic hotel well and truly on the map. In Brisbane last year, we opened two new hotels, W Brisbane and The Westin Brisbane, bringing 13 new event venues to the River City. Brisbane Marriott Hotel has also completed a significant renovation, offering refreshed and contemporary spaces for meeting and event planners. Across our resort offering, Sheraton Grand Mirage Resort, Port Douglas still wows guests to North Queensland with its recently renovated guestrooms and iconic lagoons, while Surfers Paradise Marriott Resort & Spa’s extensive amenities see it remain a popular getaway for large groups. New to the market will be The Ritz-Carlton, Perth, opening in late 2019 and marking the brand’s reintroduction in Australia. It will offer 2000 square metres of luxury event space in the city’s much-anticipated Elizabeth Quay development. We’ll also launch Element Melbourne Richmond in May 2019. The first Element branded hotel in Australia, it will feature open-flow guestrooms and social live/work/play spaces designed to accommodate both long and short-stay groups. What are your expectations for the region’s business events market over the coming years? We expect the MICE sector to continue growing, as international business travellers choose Australia as their preferred business events destination. We’re gearing up for an exciting couple of years and look forward to being at the forefront of corporate hospitality and a leading player in the MICE industry here in Australia. Aside from accommodation, what other innovations will Marriott International deliver in 2019? A key focus for 2019 will be the launch of our new loyalty program, Marriott Bonvoy, which offers members 24/7 access to unmatched benefits and experiences across 129 countries and territories worldwide. Planners can earn and redeem points when hosting a meeting, while guests can enjoy member rates on accommodation and in-destination experiences to elevate any business or extended leisure trip. 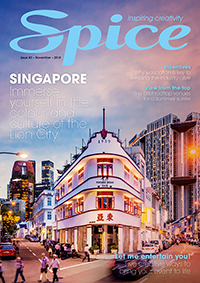 This article originally appeared in the February issue of Spice Magazine. Subscribe here.